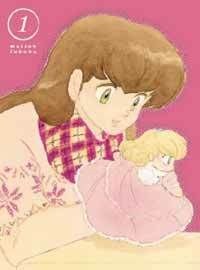 Notes: Based on the manga by Takahashi Rumiko, available from Viz. Set in 1980s Japan, Godai Yusaku is a ronin (someone who has failed university entrance exams) living in a run down apartment complex called Maison Ikkoku. Among the other residents are the nosy Ichinoses, the bombshell Roppongi Akemi, and the mysterious salaryman(or is he?) Yotsuya. The others are given to having wild parties which makes it difficult for Godai to study. Into this mayhem comes the recently widowed Kyoko as the new live-in manager. It's love at first sight for Godai, but of course he doesn't have the nerve to tell her (is he nuts?!). As time passes, their relationship slowly (and realistically) develops amid life at Maison Ikkoku, despite all sorts of romantic hurdles. Nothing, nothing, nothing can prepare you for this series. When most of you think of Takahashi Rumiko, you think super-dimensional mallets, massive glomping, slapstick humor and an entourage of characters that make the show nothing short of a circus. You would never expect that the very same Takahashi is a master weaver of subtle, gentle, and poignant relationships--sans resentment, violence, shouting matches, and "I-love-you-but-will-pretend-to-hate-you" a la kindergarten playground antics. Maison Ikkoku takes you (and nearly any Japanese person) back to the days when love was--well, still anything but simple, but sweeter and quieter than what it is today. "Moe" was nowhere to be seen, Internet and cell phones were absent, preventing a lot of today's modern-day lover mix-ups, and shounen titles were still capable of delivering love stories that made shoujo titles writhe with envy. Godai Yusaku is the boy you love more than anything, but would avoid associating with at all costs. He is, from an outsider's view, a total loser. He has failed his university exams, living on instant ramen, burying his face in dirty magazines, his life is one bad decision after another...and could very well have been an endless downward spiral into eternal loser-dom, were it not for the fateful arrival of the beautiful, but quite normal Otonashi Kyoko. Kyoko, a young widow who takes over the seemingly unglamorous and stressful job of managing Ikkoku-kan's tenants, is sweet but firm, mature and graceful--and, let's face it, totally out of Godai's league as it stands. Slowly, as a lustful Godai actually gets to know Kyoko as someone other than "the HAWT manager lady" (I exaggerate), we begin to see the gradual maturation of Godai into an aimless teenager into a mature young man, striving to be husband material for the sympathetically independent Kyoko. The realism and gradual development between the two main characters is so refreshing and never forced. While we never lose focus of the end goal in sight (this is a love story, after all), there are several detours along the way--some in the form of love triangles, other in the forms of lifetime responsibilities (Godai actually graduating college, for example). A determined Godai and the audience are all taught the virtue of patience--as much as all of us want him to win the girl, we understand (along with the main character) that truely good things are worth waiting for...and in the mean time, life goes on for everyone. Kyoko and Godai both date other people, do different things, take different paths, the only thing keeping them together being sharing the same roof of Ikkoku-kan. At one point, even that is threatened. On a personal note, it was this series that pushed me over the edge in a sense--in regards to moving to Japan. Maison Ikkoku gives a very accurate portrayal of an average Japanese person's life, especially that of a singleton living alone and fairing for themselves. We see the fun, the not-so-fun, and the very unsavory realities of living in Japan. It is cramped. It is crowded. You do spend most of your time on the floor. Making the picture of your average Japanese life even more complete is the colorful, slightly zany cast of supporting characters, starting with (but not limited to) the other tenants of Ikkoku-kan. Unlike so many supporting casts, the tenants of Ikkoku-kan are not living in a vacuum, and react to all the things that happen to our main characters. Certain "plot holes" that normally aren't addressed in other titles are questioned here (like "where is Kentaro's father?" and "what does Yotsuya do for a living? "), and each one has identities of their own with events and consequences that leak into each other's lives. Incredible animation is not necessary for telling such a breathtaking story, but fortunately, we don't have to worry about being short-changed. Of course, the vintage of this series is the early-to-mid eighties, so the animation you can expect is somewhere between the later part of Urusei Yatsura and the earlier part of Ranma 1/2, as much of the creative teams for these series took part in Maison Ikkoku. The music and sound effects are also slightly dated for the times, but the opening the ending animation sequences remain some of my favorites. The Jpop masters of the time (including actress Saitoh Yuki, Pierrot, and now defunct Anzen Chitai featuring Tamaki Kouji) lend their talents to the impressive collection of theme songs, capturing the era, the hope, the passion, and the longing in a way that most anime theme songs fail to do in more recent years. But with a whopping 96 episodes (has Takahashi ever done a single-season series other than Rumik World? ), it might take a bit of convincing to get into something (especially something as emotionally involving as this series) for the long haul. Let me put it this way: if I had my way, I would attend every anime convention and pass out copies of the series like an evangelist would Bible tracts. Unlike so many of Takahashi's recent (and loooooong!) series, this one has a solid, rewarding conclusion. One that makes you both cry and cheer at the same time. So rarely in an animated series are there characters that you laugh with, drink with, cry with, party with...and Godai and Kyoko open the door to you to join them in Ikkoku-kan...and the greatest days of their young adult lives.